Ah the telltale signs of atmospheric drag & friction burn marks... As long as you didn't bounce off to oblivion you did well - I must say! Seriously, kudos and hope to see you back on the saddle again and maybe some videos to inspire? Well I actually landed upside down in a drainage ditch jammed between a tree and a rock. I couldn't get up and had to wait for some fellow competitors to come along and help me up. Busted my hip, knee and ankle quite a bit but it's loosening up now. Didn't take any video at all. Navigating with the road book and trip meter was frankly quite enough to keep me busy. I wasn't the only retirement with one young chap being taken off in an ambulance when his wind shield came through his open face helmet. Ayayay. Mud, wet gravel. Fun fun fun. and that "windshield through open face" is a nightmare of mine. that windshield is a guillotine at the right speed and right crash. I hope he's doing fine as well. ayayay. mud, wet gravel... fun fun fun... I'm putting you in my "acts to follow" bucket now. Well it's a sorry tale really. We pulled his Dad's GS out of a ditch (facing the wrong way) and when I asked him what happened he said he was just trying to keep up with his son. Back at camp that evening, his son's GS came in on the back of a pick up looking very battered and there was an ambulance in the yard. The accident had broken the screen and that came through his helmet and effectively severed his nose. I thanked my lucky stars and headed off for some more JD special medicine. There were some section with a very narrow margin for error. Some riders who made it through day one actually didn't ride on day two saying that it had been enough and they were quitting whilst ahead. These bikes are just to big really to chuck about in those sorts of conditions. Energy = mass x velocity. I was doing 40 mph on the fire breaks and lads on their Enduro bikes were coming past me at 60. But their bikes were so light that they could right them on their own. One lad )on You Toob) buried his 800 Tiger and there were 10 people pulling it out. 250+ kg of bike and the King of Pies sitting atop was a recipe for disaster really. Just been to the bike shop to sit on a Honda CRF 250 Rallye. I'm ok just very disappointed not to have completed it, significantly poorer for the experience and still got bits to attend to plus the limp and sore leg. But other than that it was fantastic! Yeap, riding those conditions on big bikes requires a completely different skill set and training. What you can do any day on a lightweight enduro is completely different ballgame on these big bikes. Severed his nose... that is horrific. Open face helmet on this track with a big bike with windshield. That tells me that the kid never did this on that bike. Anybody who does dirt on these bikes knows that "you eventually bang your faceshield on that d@mn windshield" - eventually. And you'd better have protection when that happens because it won't be a nice bang - front compressing so much that your elbows buckle and your head comes down hard. It's almost never a slow, nice kiss... So sorry for the lad - and the dad too. I pray he recovers quickly as well. Training, training, training. GS adventure team level training - that's what I want! And don't have the time and money for! 40 mph! I have no shame, if I felt I need it, I'd paddle out of some areas and drop down to 15 / 20 mph right away. Balls of brass to all who did this rallye. Though I'd say definitely not an amateur level big bike compatible event. Great as a leisure, fun, two day ride event - but definitely not a rallye event for the common folk. 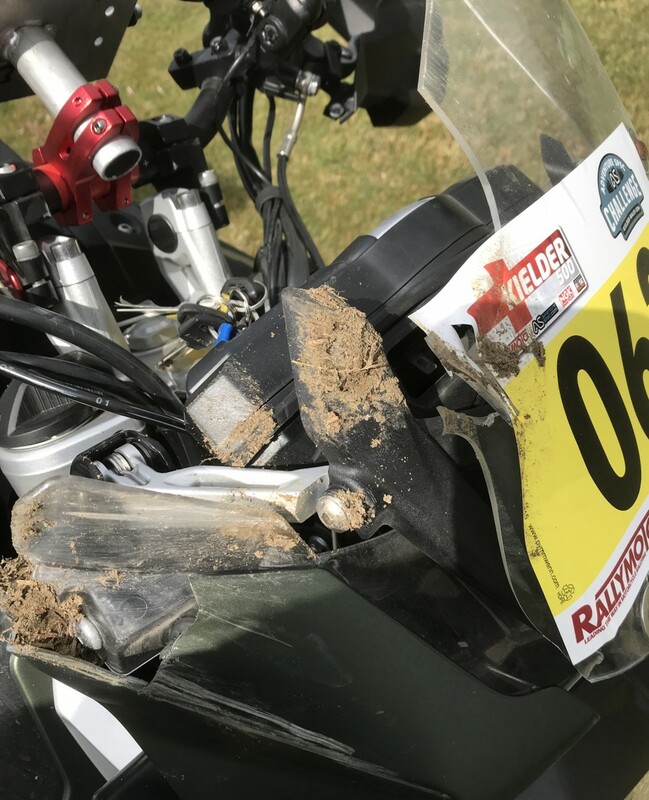 No disrespect to the organisers (and it was VERY well organised) but to suggest that it was suitable for beginners and for big adventure bikes to have a taster of what Dakar style riding is like, is slightly disingenuous. Most of the top riders were NOT on what I'd call adventure bikes like the GS, Tiger, Versys, Ducks and so on. Sure a fair few Africas and KTMs (which in my view are thinly disguised as long distance comfy touring bikes), were there but it was the light weight dirt bikes that ruled. Even the 80 Tigers were a bit heavy for this. But a great event here in the UK is you like this style of riding. 2 legs still run run but safe to say I won't be there.